Notes: This is the dubbed, heavily edited North American television release. The original Japanese series is reviewed separately, as the edits are so pervasive and complete that CardCaptors is effectively a completely different series that merely happens to share the same animated footage. The saddest thing for me, and the rest of the club, to announce, was that our premonitions, aired in a previous editorial on this series, came to pass exactly as we thought they would. I actually wish I didn't live to see this air. Has anyone told CLAMP yet? This is the foremost example of just how much bad dubbing and adaptation can absolutely destroy the charm of an anime series. 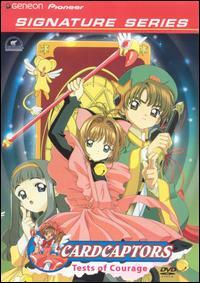 CardCaptors is NOT an accurate rendition of the original Card Captor Sakura TV series, and was really never intended to do so. Nelvana never wanted something to appeal primarily to a young female audience and draw them back into watching television - no, that's too much of an economic gamble and an unsure option. So they made Li Shaolan the co-star. In fact, now he is the competent Card Captor, who's supposed to teach Sakura how it's done, because "girls can't do anything right." Do you think I'm kidding? Watch an episode of this, and you'll see Sakura being derided while Li takes all the glory, or "helps" her get a Clow Card. If you're a fan of the Card Captor Sakura TV series, you'll probably remember Rika, the girl who has the crush on her teacher. Of course that had to be changed - but what did they do? Now the teacher openly ridicules her in class, while she just looks at him and tells him she'll do better next time. I'm not sure that's such a good trade - either way, neither character is portrayed with any sort of realism. In fact, the whole cast is a bunch of awful stereotypes. Sakura - oops, Suh-KOO-ruh, is now a clone of Britney Spears (which doesn't sound right, because that's teenage, not preteen territory). Tomoyo - oops, Madison, now fawns over her audiovisual equipment and has become the new Sailor Mercury. (Because it isn't acceptable for children to be doting over each other in North America, right? BAH!) Kero-chan now has the sub-Casey Kasem voice of Artemis from Sailor Moon (umm, why?). Touya/Tory is an uncaring, apathetic brute (not a chiding, but loving older brother as he should be), and Yukito/I forget WHAT they named him - well, he's not even there! Not to mention the absurd editing and renumbering of episodes, which destroys any sense of continuity, even without the context of the original. I guess this says a lot about our society when all of this is considered more relevant to our youth than the gentle, cute, and fun original. Very little of it good, I might add. As a stand-alone, CardCaptors may be mildly enjoyable for the (very) forgiving, but for anime fans (seasoned or not) that have seen even the smallest proportion of what Japan has to offer, this adaptation is disheartening, disgusting, and downright unforgivable. It's a lost opportunity for bringing back a young female audience that's been ignored since My Little Pony and Wildfire, and it firmly states that, in America, television animation is purely "boys' territory", which is sexist and inaccurate, if not blatantly offensive. No wonder young American girls don't watch TV, if they're being offered such insipid crap! Recommended Audience: Sanitized for your, ahem, enjoyment.